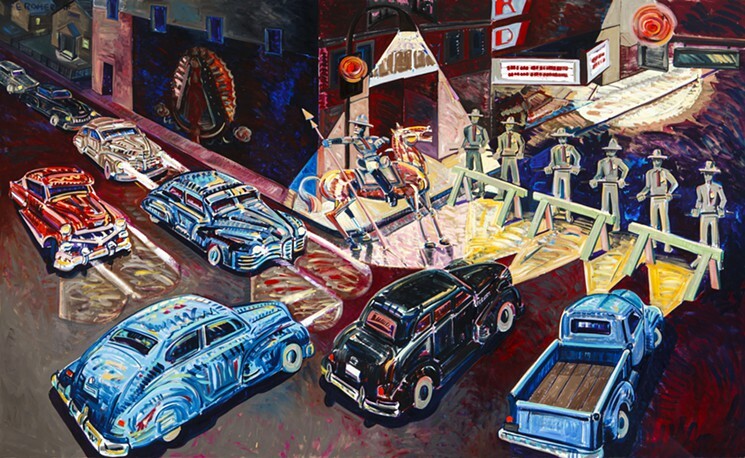 Frank Romero, The Closing of Whittier Boulevard, 1984, Oil on Canvas, 72 x 120 in. Curator Edward Hayes, Jr. admits he may have gotten to the Chicano Art party in a roundabout, later-rather-than-sooner way. But as a curator at the Museum of Latin American Art (MOLAA) in Long Beach and one of the visionaries responsible for Dreamland: A Frank Romero Retrospective, the recent MOLAA exhibition, he is now among a handful of trailblazing museum professionals making sure the art world understands how much Chicano Art matters and why. The son of a U.S. State Department satellite communications engineer who married a Mexican-born woman with roots in Sinaloa, Hayes spent his early childhood on an extended tour of U.S. Embassy outposts in Quito, Ecuador and Dhaka, Bangladesh, among others. His family eventually settled in central Texas, where remained until he joined MOLAA as the Curator of Exhibitions three years ago. Returning to his hometown, he enrolled in a graduate art history program at the University of Texas-San Antonio, where he began a serious study of Chicano and Latin American art while working with UTSA’s art collection. “For the first time, I saw all these incredible Chicano artists,” Hayes says. It was also on the UTSA campus that he chanced upon a print by Frank Romero in a hallway outside of the offices of then UTSA President Dr. Ricardo Romo, an avid Chicano art collector. The retrospective featuring artist and Boyle Heights native Frank Romero is more than simply an art exhibition, suggests Hayes, it is also examination of the profound impact his work has had across a spectrum of social, political and cultural landscapes in Southern California. Hayes suggests. It is the first-ever solo museum show of Romero’s work, and, according to him, it was germinated on actor Cheech Marin’s front porch. “From then on it was getting to know Frank and what his career looked like. All of his contributions… He’s 75-years-old and still making work,” Hayes says with obvious awe. Dreamland took shape, he says, from conversations with Romero which took place during weekly visits to the artist’s Lincoln Heights studio. “Every Monday morning near Pasadena and Ave 34,” says Hayes. He was impressed by the vast quantity, the caliber and the wide range of media to found in Romero’s personal art stash, work which he chose not to sell or simply held onto for personal or political reasons. The Dreamland exhibition is organized around tone and themes as much as it is a chronology of Romero’s evolution as an artist, offers Hayes. While MOLAA boasts several large gallery spaces, the prolific nature of Romero’s work in ceramics, painting and on paper required almost every inch of available wall surface to accommodate the extensive inventory of catalogued items ultimately included. “You walk in, and your hit with neon, ceramic, works on paper, gouache and there is Paris, New Mexico,” Hayes says to describe how the curatorial process unfolded. The first room presents a primer of sorts, more of a broad survey using works from Romero’s collection and, as such, includes work by other artists in his circle, artists he admired. Among them are pieces by Carolyn See and Carlos Almaraz. Both Romero and Almaraz were associated with Los Four, a Chicano art collective which also included Beto de la Rocha and Gilbert “Magú” Lujan. All four were part of a 1974 exhibition held at the Los Angeles County Museum of Art. However, the relationship between Almaraz and Romero went deeper still, argues Hayes. “They lived together. They were in New York together. They took the same classes at Cal State L.A. where Frank was introduced to ceramics,” says Hayes. Featured in the first gallery space are Romero’s middle-school sketchbook, a still life of a football player rendered in a powerful style and The Teddy Bear, a painting made in 1955. From a curatorial perspective, says Hayes, Dreamland posed a number of challenges due to the sheer volume of work and vast range of subject matter. But it was also alluring because it provided him an opportunity to discover Los Angeles and the predominantly Chicano East side through Romero’s eyes. “We just celebrated the 25th anniversary of the L.A. riots. And here’s Frank who has a painting called L.A. on Fire, which is about that,” he says. The painting shares space alongside The Closing of Whittier Blvd. in the gallery where many of Romero’s more overt socio-political commentary are assembled. “That room is really kind of haunting,” Hayes says ruefully.